Jim is a sought after financial advisor with noteworthy credentials. Jim has successfully parlayed his twenty years of experience as a CFO in the global asset management industry, most recently as CFO at Babson Capital, to serving as a personal CFO. Working with families and entrepreneurs of means, Jim helps his clients to create comprehensive, integrated approaches to managing their personal financial and business affairs. Taking into account all aspects of his clients' and their loved ones' lives, Jim helps his clients balance short term savings and cash flow planning needs with the realization of long-term financial security and wealth accumulation and preservation objectives. He is laser focused on replacing the murkiness -sometimes fear and avoidance - and burden of the financial management process with a clear line of sight to the achievement of his clients' goals. 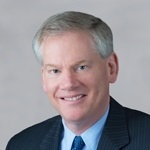 In his capacity as a personal CFO, Jim directs a team of internal and external subject matter expert colleagues who provide deep technical knowledge and customized analysis in the disciplines that are crucial to the development of robust, long-term financial roadmaps that respond to and support each client's unique circumstances. Jim believes that "choice, not chance, determines one's destiny." He is dedicated to educating his clients about their choices and helping them to build, execute on and oversee, sound forward thinking financial and investment plans. His clients tell him that he helps them to see their financial and business affairs with purpose, clarity, a longer term view and from perspectives that they have not seen before. Jim graduated from the University of Connecticut with a B.S. in Accounting and holds an MBA from Babson College. He holds several securities licenses which enable him to offer comprehensive, full service financial planning and investment advisory services. Jim is a former CPA and is licensed to offer Life, Accident and Health insurance. Active in his community, Jim also serves on the Philanthropic Board of the Boston Medical Center. He resides in Needham, MA with his wife, Soni and their two daughters.